Students and three professors (Michael Fuller, Neathery Fuller and David Hanlon) from St. Louis Community College visited the church of the Holy Virgin in the town of Barabeit on 22 June 1990. This community is situated in the most Northeastern corner of Syria. Only 2 Christian families remain in this village, so the church is rarely opened. Interior view of the Church of al-Adhra "Holy Virgin." The sanctuary of the church measures 8.13 meters wide by 8.59 meters long. The haikal (Syriac, Holy of Holies) measures 3 meters long by 8.13 meters wide. Four wooden benches were pushed against the north wall while one wooden bench was against the west wall. 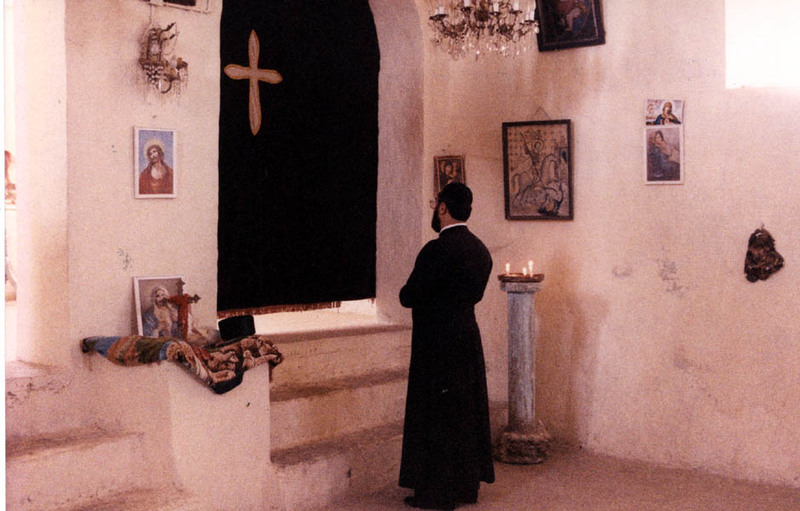 The methbah (Syriac, altar) within the haikal of the church. The back of the altar opens into a small chamber that measures approximately 60 cm. by 100 cm. Inside the small chamber was a wooden box that contained a small bundle of wax candles and a small bottle of olive oil (for the oil lamps). A second, small bottle of olive oil was outside of the wooden box, but still within the chamber. The baptism font is situated in the southwest corner of the church. Two wooden sticks are placed in the form of a cross over the mouth of the baptismal font. Abouna Louise (Syriac Orthodox Priest) offers prayers and candle offerings during our visit to the church. Color photographs by Professor Neathery Batsell Fuller and black-and-white photographs by Professor David Hanlon.